There's just as much garbage on the black market for anabolic steroids in South America as there is anywhere, going by an analysis of over three hundred preparations done in the lab of the Brazilian federal police. The quality of oil-based preparations was particularly bad: 65.6 percent were dubious. 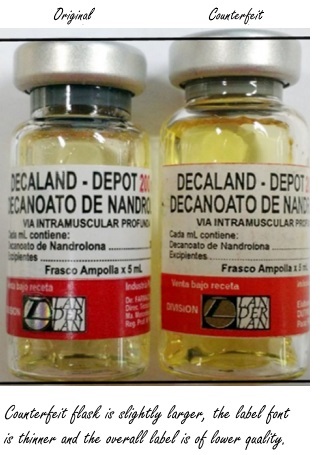 In 2013 analysts at the National Institute of Criminalistics in Brasilia published the results of a study which showed that about 40 percent of the anabolic steroids on the Brazilian black market were of dubious quality. The same researchers published a similar analysis in the June 2017 edition of Forensic Science International. The Brazilians analysed a total of 345 samples of products confiscated by the police in the period 2011-2016. In South America like everywhere else it's only experts who are capable of distinguishing fakes from authentic preparations. Examples of a genuine and fake version of Decaland are shown here. "This is one of the largest available studies concerning the quantitative analysis of medicines and dietary supplements containing or suspected to contain anabolic androgenic steroids," the Brazilians wrote. "The high rate of counterfeiting found in this study, mainly products of non-Brazilian origin, demands more incisive actions from government agencies aiming at decreasing the availability of black market products worldwide." The researchers are concerned. And probably they'd be even more concerned if they had also been looking for heavy metals and other forms of industrial pollution in the preparations. When Northeast Laboratories bought steroids on the internet a few years ago and subjected them to a detailed analysis, the researchers discovered that they were full of lead, tin, arsenic and toxic solvents. Antidoping Switzerland Foundation published the amount of steroids and other bodybuilding drugs that the Swiss customs confiscated in the period 2013-2014. Black China Labs is the worst when it comes to messing about with label information. German biochemists analysed all doping substances that the German customs seized in the period 2010-2013, and made a number of interesting discoveries.